Sometimes your mouse cursor (pointer) disappears; is invisible / missing on your MacOS High Sierra MacBook. 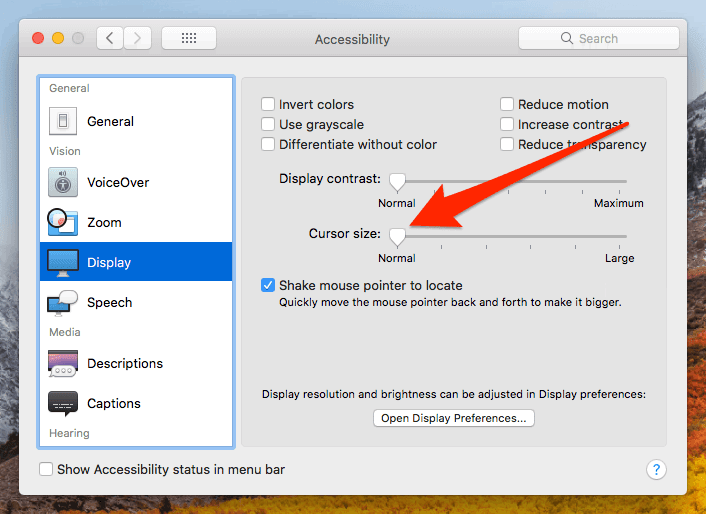 In this article, I teach you how to fix the disappearing cursor problem. The first thing that you can do is right-click. Go ahead. Press the right-click button on your mouse. Does it bring the cursor back to your MacBook’s screen? If not, try the other fixes below. Finally, drag the Cursor size slider to the right to increase the size. Sometimes, a program you open causes the issue. Simply press ﻿Command (⌘) and Tab to switch windows. Then, press the keys again to go back to the previous window. The mouse cursor ought to pop up. Drag as if to select an area. Your mouse cursor ought to reappear. But, if it does not, continue with the other fixes. Then, hit the Power button again to boot your Mac again. Once it boots, check if the cursor works. Press your power button to turn on your Mac. Immediately after the startup sound, press and hold Command (⌘), Option, P, and R.
Keep holding these keys until your computer restarts again. Are you watching YouTube videos? Or, maybe you use the Showtime Anytime app? Sometimes, these apps attempt to hide the mouse cursor during video playback. Pause the video to see if the cursor shows up. Do you use an emulated environment? Then, the cursor sometimes sticks in the emulator. Close it and your mouse should pop up on the Mac screen.